یزدانی, سعید, تهامی پور, مرتضی. (1393). شبیه‌سازی اثر سناریوهای مختلف قیمت‌گذاری بر نظام تعرفه آب شهری. مجله آب و فاضلاب, 26(1), 97-106. 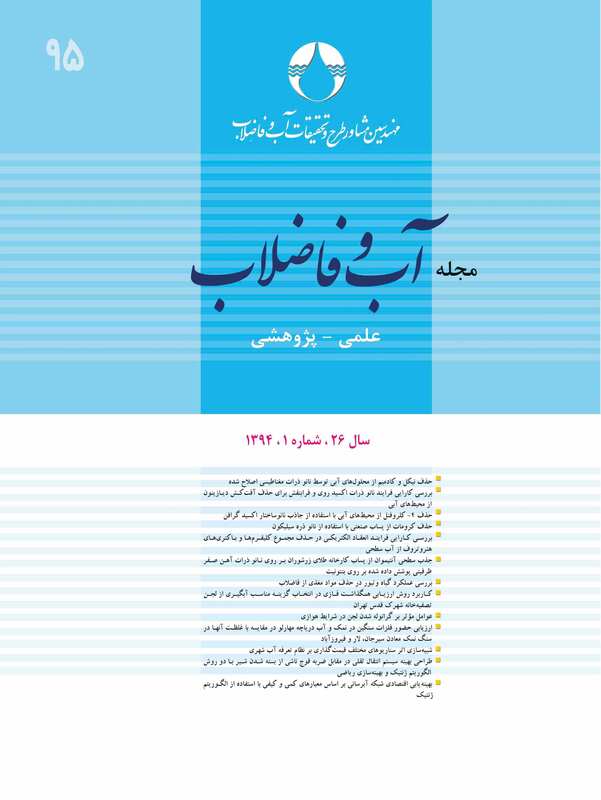 سعید یزدانی; مرتضی تهامی پور. "شبیه‌سازی اثر سناریوهای مختلف قیمت‌گذاری بر نظام تعرفه آب شهری". مجله آب و فاضلاب, 26, 1, 1393, 97-106. یزدانی, سعید, تهامی پور, مرتضی. (1393). 'شبیه‌سازی اثر سناریوهای مختلف قیمت‌گذاری بر نظام تعرفه آب شهری', مجله آب و فاضلاب, 26(1), pp. 97-106. یزدانی, سعید, تهامی پور, مرتضی. شبیه‌سازی اثر سناریوهای مختلف قیمت‌گذاری بر نظام تعرفه آب شهری. مجله آب و فاضلاب, 1393; 26(1): 97-106. مدیریت تقاضای آب و تخصیص بهینه آن، از اهمیت ویژه‌ای، برخوردار است. از جمله مهم‌ترین سیاست‌های قیمتی می‌توان به تعیین نرخ مناسب برای آب در مصارف شهری اشاره نمود. در این ارتباط قانون هدفمند کردن یارانه‌ها با تأکید بر دریافت قیمت آب بر اساس هزینه تمام شده آن، روی مدیریت منابع آب اثر زیادی خواهد داشت. بنابراین این مطالعه با هدف تعیین نرخ مناسب آب در مصارف شهری استان گلستان در سال 91-1390 تحت قانون هدفمند شدن یارانه‌ها انجام شد. برای رسیدن به این هدف ابتدا با استفاده از روش ارزشگذاری مشروط، ارزش اقتصادی آب در مصارف شهری که دیدگاه تقاضاکنندگان آب را نشان می‌دهد،‌ برآورد شد. سپس با استفاده از رویکرد هزینه متوسط، هزینه تمام شده آب از دیدگاه عرضه‌کنندگان آب از منابع سطحی و زیرزمینی تعیین شد. در نهایت ضمن مقایسه تعرفه‌های فعلی آب با ارزش اقتصادی و هزینه تمام شده آب،‌ گزینه‌های مختلف قیمت‌گذاری آب شرب در راستای قانون هدفمند‌سازی یارانه‌ها مورد ارزیابی قرار گرفت. بر اساس نتایج به‌دست آمده، پیشنهاد می‌شود تعرفه آب شرب در یک سیستم قیمت‌گذاری پلکانی و بر اساس ایجاد توازن بین ارزش اقتصادی و هزینه تمام شده آب تعیین شود تا مدیریت عرضه و تقاضای آب به‌صورت توأمان محقق شود. Water demand management policies and water pricing tools have important effects on optimal water allocation. An important water pricing policy is determining suitable water tariffs for urban water uses. In this regard, the emphasis laid by the targeted subsidy law on water pricing based on supply cost will have a great impact on the price of water and on water resources management. Based on these considerations, the present study was designed and conducted in 2010-2011 to identify proper water prices for Golestan Province under the targeted subsidy law. For this purpose, the economic value of water as veiwed by urban users was estimated using the contingent valuation method. In a second stage, the average cost approach was employed to determine the cost of water production from surface and ground water resources from the viewpoint of suppliers. Finally, the present water tariffs, the economic value of water, and the average cost of water production obtained in the previous sategs were compared to evaluate various scenarios of water pricing under the targeted subsidy law. Based on our findings, a stepwise water pricing system that strikes a balance between the economic value of water and water production cost is recommended for implementation in order achieve simultaneous improvements in both water demand and supply management. 1. Faux, J., and Perry, G.M. (1999). “Estimating irrigation water value using hedonic price analysis: A case study in Malheur county, Oregon.” Land Economics, 75(3), 440-452. 2. Wang, H., and Lall, S. (1999). Valuing water for Chinese industries: A marginal productivity assessment, The World Bank, Policy Research Working Paper No. 2236, Washington, DC. 3. Pazvakawambwa, G.T., and van der Zaag, P. (2000). “The value of irrigation water in Nyanyadzi smallholder irrigation scheme, Zimbabwe.” 1st WARFSA/Water Net Symposium, Maputo. 4. Sahibzada, S.A. (2002). “Pricing irrigation water in Pakistan: An evaluation of available options.” The Pakistan Development Review, 41(3), 209-241. 5. Schuck, E., and Green, G.P. (2003). “Conserving one water source at the expense of another: The roles of surface water price in adoption of wells in a conjunctive use system.” Water Resources Development 19(1), 55-66. 6. Lehtonen, E., Kuuluvainen, J., Pouta, E., Rekola, M., and Li, C. (2003). “Non-market benefits of forest conservation in southern Finland.” Environmental Science and Policy, 6, 195-204. 7. Kramer, R.A., and Mercer, E. D. (1997). “Valuing global environmental goods: US residuals willingness to pay to protect tropical rain forests.” Land Economics, 73, 196-210. 8. Loomis, J.B., and Gonzalez-Cabon, A. (1998). “A willingness to pay function for protecting acres of spotted OWL habitat from fire.” Ecological Economics, 25, 315-322. 9. Kristrom, B. (1999). Valuing forests, MBG Press, St Louis, Stockholm Sweden. 10. White, P.C.L., and Lovett, C. J. (1999). “Public preferences and willingness to pay for nature conservation in the North York Moors National Park.” Journal of Environmental Management, 55, 1-13. 11. Farlofi, S., Mabugu, R., and Ntshingila, S. (2007). “Domestic water use and values in Swaziland: Contingent valuation analysis.” Agrekon Magazine, 46(1), 157-170. 12. Guha, S. (2007). “Valuation of clean water supply by willingness to pay method in developing nation, A case study in Calculate.” Jabalpur University, India. 13. Gnedenk, E., Ghorbunova, Z., and Safonov, G. (1999). “Contingent valuation of drinking water quality in Samara city.” Moscow State University, zone “I”, room75, Moscow, 117234, Vorobievy Gory. 14. Gnedenko, E.D., and Ghorbunova, Z. (1998). “A Contingent valuation study of projects improving drinking water quality.” Modern Toxicological Problems, No. 3, Kiev. 15. Whittington, D., Lauria, D.T., Wright, A.M., Choe, K., Hughes, J.A., and Swarna, V. (1993). “Household demands for improved sanitation services in Kumasi, Ghana.” Water Resources Research, 29 (6), 1539-1560. 16. Banda, B., Farolfi, S., and Hassan, R. (2004). “Determinants of quality and quantity values of water for domestic uses in the steelpoort sub-basin: A contingent valuation approach.” Proceedings of the Conference: Water management for local development, Loskop Dam, Earth scan pub., London. 17. Awad, I., and Holländer, R. (2010). “Applying contingent valuation method to measure the total economic value of domestic water services: A case study in Ramallah governorate, Palestine.” European Journal of Economics, Finance and Administrative Sciences, 20, 76-93. 18. Young, R. A. (2005). Determining the economic value of water: Concepts and methods, Infarma Copany Pub., USA. 19. Hanemann, W. M. (1994). “Valuing the environment through contingent valuation.” Journal of Economic Perspectives, 8(4), 19-43. 20. Hanemann, W. M., Loonis, J., and Kanninen, B. (1991). “Statistical efficiency of double-bounded dichotomous choice contingent valuation.” American Journal of Agricultural Economics, 73(4), 1255-1263. 21. Lee, C. (1997). “Valuation of nature-based tourism resources using dichotomous choice contingent valuation method.” Tourism Management, 18(8), 587-591. 22. Hanemann, W. M. (1984). “Welfare evaluations in contingent valuation experiments with discrete responses.” American Journal of Agricultural Economics, 71(3), 332-341. 23. Maddala, G.S. (1991). Introduction of econometrics, 2nd Ed., Macmillan, New York. 25. Cochran, W.G. (1977). Sampling techniques, 3rd Ed., Whiley and Sons Pub., USA.